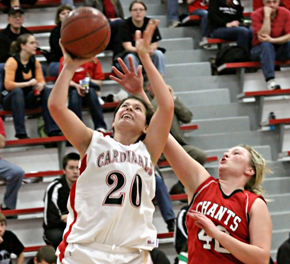 The host Lady Cardinals kept their winning streak intact at six, sweeping to the championship of the 2010 Boone Central Holiday Basketball Tournament Dec. 28-29 in Albion. Gothenburg rallied with a big 4th quarter to defeat the Boone Central boys in the opening round Tuesday, but the Cardinals bounced back to top St. Paul for 3rd place the following afternoon. 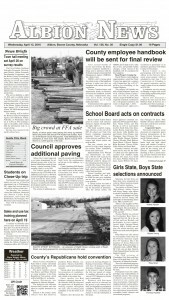 The Boone Central girls looked like they never took a holiday break Tuesday. 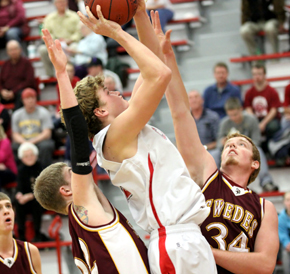 The Cardinals were focused and aggressive from the opening tap and rolled over a winless Gothenburg squad 74-31. Boone Central’s strong play continued in the championship game as the Cards used a decided second-half advantage in the paint and a 26-11 3rd quarter blitz to spark a 76-41 win. A solid Ord team fell behind Boone Central 15-4 in the opening quarter of the girls title game, hung with the Cards in the second period, but could not stand the big run following halftime. Boone Central dominated the inside action in the second half as post players Lehmann, Sara Wells and Maria Glidden combined for 36 points and 14 rebounds. The Boone Central Cardinals struggled mightily on offense during the opening round of the boys holiday tournament, then had a late defensive lapse in a 43-32 loss to Gothenburg. After holding a slim edge despite their scoring problems for most of three quarters, the Cards were outscored 21-9 in the 4th quarter. The Swedes took advantage of numerous BC fouls, hitting 10-of-18 free throws in the period. Boone Central did not make a lot of changes Wednesday, according to Zoucha, but enjoyed much more success in a 54-48 victory over St. Paul. The key was a strong finish, as the Cards outscored the Wildcats 15-5 in the final eight minutes. After a trio of 3-point field goals and 10 3rd quarter points by Casey Poss boosted St. Paul to a 43-39 lead, Card senior Keenan Howell led the 4th quarter charge with six points while Boone Central clamped down defensively. “We knew coming into this game everything St. Paul did went through one player. We also knew they would shoot a lot from outside and they took 30 3-point attempts in this game,” Zoucha noted. “We once again saw our team work extremely hard on defense and, while there were a few letdowns, they played through them. “We also worked the ball better on offense. We never changed our strategy from the day before. We just reminded the team to keep doing what we had focused on and get better at it.